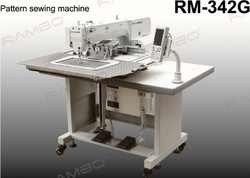 RAMBO Sewing Equipment Manufacturing Co.,ltd is a professional manufacturer that engages in the development, production, sales and service of the automatic sewing machines. RAMBO takes great pride in the importance of R&D and innovation to create best in class sewing machines to meet the demand of global clients. RAMBO professional team brings great strength to RAMBO and helped RAMBO become a leading solution provider for sewing machines to many global customers. We strive to provide our customers with the most efficient machines for maximum production and cost savings in their manufacturing process. 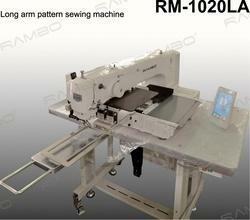 RAMBO focuses more on automatic sewing units,every year RAMBO will develop new amazing machines for customers. RAMBO sales cover domestic and oversea markets, and RAMBO machines already sold to more than 20 countries from North America, South America, Asia, Middle East ,Africa and Europe. RAMBO welcome the customers all over the world. 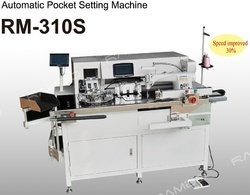 Rambo automatic pocket setting machine can work different thickness fabric on different pockets such as jeans pocket, shirt pocket, casual pants pocket, polo shirt, lycra shirt. Automatic folding system, cylinders and folding knives all adjustable to meet different size pockets, highly working efficiency, ironing free, save much labor cost. Adjustbale inner clamp system meet for heavy material pockets . 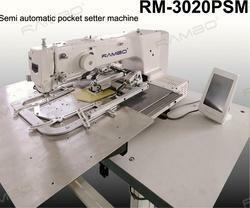 Automatic material collecting robot, finished pockets orderly collected. Suitable for : Decorating and cascading sewwing on big size sports shoes. Casual shoes, Roller skates, Safety shoes, Military shoes, Ladies shoes, High boots and some leather bags. 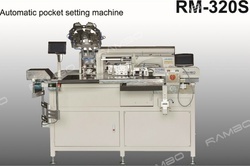 All the processing jobs automatically finish the pockets, improve the pockets quality and working efficiency as well. Folding, position, bartacking, sewing, collecting, no need hand working. Easy to operate the machine, easy to change the clamps, and clamps cost low.